So, I thought that the poster for stoner comedy Bad Batch was really funny. 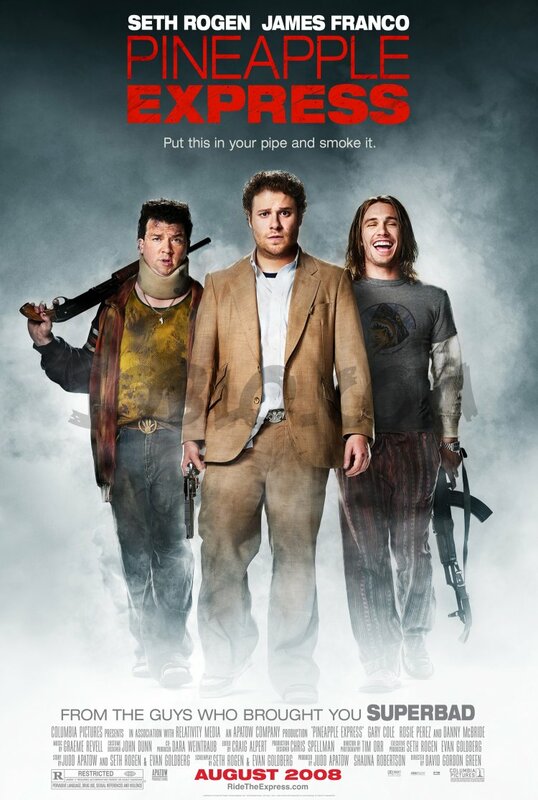 However, this poster for Pineapple Express, which also has quite a few stoned references and jokes, leaves me cold. But does that mean anything? Not much probably. I’m sure a lot of other people will have the opposite reaction. I myself don’t even think Bad Batch will be a better film than Pineapple, based on the the people involved in each. But it is a data point. I do agree with Chris that this poster is trying to sell the film as pot and guns, and is doing that very clearly. It’s easy to look at the poster, at their formation, their expression, the guns and the smoke and think “action film, but the heroes are high.” So good job on that aspect. But although I can imagine a film like that being lots of fun, Pineapple is just not getting to me. Perhaps it’s just the wrong kind of humor. Perhaps it’s because the characters look annoying as hell in the poster, especially James Franco (contrast that with Superbad and Knocked Up, where the characters looked funny and relatable). Perhaps I just have a prejudice against pot smokers that I didn’t know before, and that for some reason didn’t stop me from enjoying Knocked Up. I don’t know what it is exactly, but it’s just not making me smile. Bad Batch is funnier. (Got my hands on a screener copy.) Should be coming out soon…hopefully! I love that film- it’s so, so funny!